Empirical studies have established that the log-normal stochastic volatility (SV) model is superior to its alternatives. Importantly, Christoffersen-Jacobs-Mimouni (2010) examine the empirical performance of Heston, log-normal and 3/2 stochastic volatility models using three sources of market data: the VIX index, the implied volatility for options on the S&P500 index, and the realized volatility of returns on the S&P500 index. They found that, for all three sources, the log-normal SV model outperforms its alternatives. Andersen et al (2001) and (2001) examine the realized daily return volatilities on stocks in the Dow Jones Industrial Average and Deutschemark and Yen exchange rate against the dollar, respectively, using high-frequency intraday data. For both equity and FX realized volatilities, they found that the unconditional distributions of realized variances have a large positive skewness. At the same time, the realized logarithmic standard deviations are approximately Gaussian indicating that increments of the log of the volatility are approximately Gaussian, as in the dynamics implied by the log-normal volatility process. Yet the lognormal stochastic volatility model cannot be solved by analytical methods available for affine models, such as the Heston model. To circumvent this, I show that the moment generating function (MGF) for the log-normal SV model can be decomposed into a leading term, which is given by an exponential-affine form, and a residual term, whose estimate depends on the higher order moments of the volatility process. I prove that the second-order leading term is theoretically consistent with the expected values of the log-price and the quadratic variance (QV), their variances and the covariance between them. I show, by comparison to Monte Carlo simulations, that the second-order leading term is precise for the valuation of vanilla options on the equity and on the QV using Fourier inversion techniques. I then apply this solution method to evaluate vanilla options and to estimate the model parameters by maximum likelihood. I also provide examples of such an econometric estimation from the time series of S&P 500 and EuroStoxx 50 stock indices and from implied calibration to implied volatility surface. Finally, I discuss the difference between estimated implied and realized skews using the log-normal SV model, and mention some applications for statistical arbitrage strategies. This statement follows by assuming that returns are normal with the volatility V conditional on the steady-state distribution of the volatility V. The unconditional distribution of returns is then obtained by integrating out the volatility variable V. The result of a direct computation which leads to a variant of the t-distribution is reported by Miguel A. F., Gerig A. and J. Vicente (2009): “Universal Behavior of Extreme Price Movements in Stock Markets,” PLos One 4(12) e8243 – http://www.ncbi.nlm.nih.gov/pmc/articles/PMC2793428/ Forsberg-Bollerslev (2002) state when the steady-state distribution of the variance (the volatility squared) has the Inverse Gamma distribution then the unconditional distribution of returns is Normal Inverse Gaussian (NIG) – Forsberg, L. and T. Bollerslev (2002): “Bridging the gap between the distribution of realized (ecu) volatility and arch modelling (of the euro): the garch-nig model,” Journal of Applied Econometrics, 17, 535–548 – http://public.econ.duke.edu/~boller/Published_Papers/joae_02.pdf. In my own computations, I get an equation including hyper geometric functions. Also, I looked at the model estimation using high frequency data. 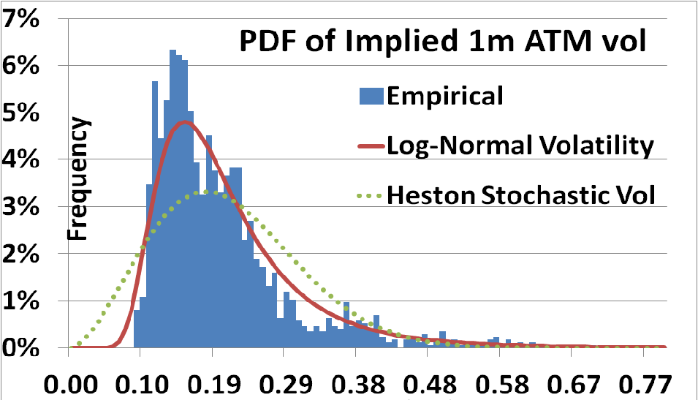 It turns out that the log-normal volatility is the best candidate for modeling the stochastic volatility of high frequency returns, while all other stochastic volatility models cannot fit the data.